Ever notice how your kids seem to get sick within the first few weeks of returning to school after summer vacation? Your children have been perfectly healthy all summer but come down with the sniffles or worse, the flu, shortly after school starts. Now you have to figure out childcare and plan for the possibility of doctor visits. Meanwhile your child is missing valuable classroom time, falling further and further behind their classmates. The fact is that thousands of individuals go in and out of your child’s school every, single day. And where people congregate in numbers, infectious pathogens are sure to congregate alongside them. Germs and viruses can be spread by aerosols, the small droplets of saliva created through a cough or sneeze, and by direct contact, such as when someone wipes their nose on their hand and shakes your hand or touches a surface. The average student misses four and a half days of school annually with the majority of these absences being due to illness. Students are the only ones affected by the unhealthy conditions frequently found within school grounds. Teachers and other staff are also exposed. The average public school teacher misses over five days of school each year. These absences cost school a total of over $4 billion on substitute teacher pay alone. Adding up all of the other associated costs and teacher absenteeism costs the American public school system in excess of $25 billion every year. But why are schools such a breeding ground for infectious disease? Besides the previously mentioned fact that they are high-trafficked areas, routine cleaning protocols are rare in our children’s schools. Less than 45% of school districts provide guidance for routine infections disease prevention and cleanliness is generally defined by visual inspection only. Most schools rely on a regimen of traditional cleaners such as bleach solutions, ammonia, and other chemical-laden disinfectants. In addition to compromising indoor air quality, these cleaners work on a very short-term basis.When sprayed on a surface they quickly destroy bacteria and viruses but once the solution evaporates the surface is again left vulnerable to exposure to pathogens. The only way to ensure that surface are free from illness-inducing pathogens is to repeatedly apply disinfectants on the same surface. This approach uses a lot of product, which directly hurts school’s budgets, student’s and staff’s health, and the environment. But what other options are there? There’s MonoFoil. MonoFoil uses a patented new technology that, like traditional disinfectants, destroys pathogens instantly. Unlike traditional disinfectants however, MonoFoil disinfects through a physical means rather than a chemical means, literally exploding the pathogens it comes into contact with. This physical approach kills 99.9% of pathogens on contact, even resistant pathogens like Staph and MERSA, and does it so quickly that pathogens cannot grow resistant to MonoFoil over time. Another thing MonoFoil does differently is that rather than simply sitting on the surface it is applied to, it actually bonds to the application surface at a molecular level and continues to work for up to 30 days after it is applied and continues working for the entire duration of that time. No more spraying chemical-laced, heavily scented cleaners on surfaces time and time and again. With MonoFoil you spray once, pathogens are killed instantly, and the surface is kept pathogen-free for up to a month. For high traffic areas more frequent application may be necessary as abrasive actions can wear down MonoFoil’s bond with the surface. Even when concentrating on high traffic areas, MonoFoil still requires less product application and lasts longer than other products. Deploying the use of MonoFoil in local schools is easy. Simply contact your local MonoFoil professional and set up a treatment plan. In most cases a service technician will visit the school on a quarterly basis. Application technicians are certified by MonoFoil and provide top-notch quality work. In addition to the product application, the technician also supplies the school with handheld products that can be distributed among teachers and other staff to be used on an as-needed basis.This approach allows for the maximum microbe protection possible. Many school districts across the United States are already using MonoFoil within their schools to great success. This cost for service is reasonable, is based on square footage, and can be allotted for within the school’s annual budget. At a time when many school budgets are getting slimmer each year, it can be difficult to rationalize the cost of switching disinfectant protocol but when the cost of MonoFoil is compared with the costs associated with teacher absenteeism due to preventable sickness, the winner is clear: MonoFoil saves schools money and keep kids healthy. Healthy schools equal healthy students that are able to stay in class, earn their education, and look forward to their own bright futures ahead. 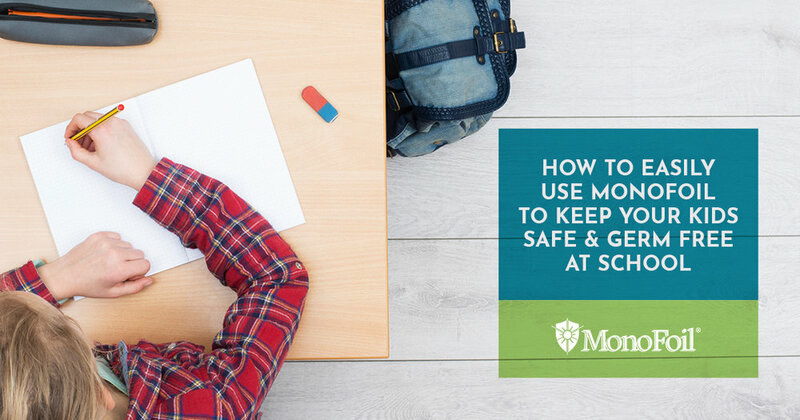 Let you friends know how to keep their classrooms germ free! Older PostAre There Actually Strange Toxins Under My Sink?